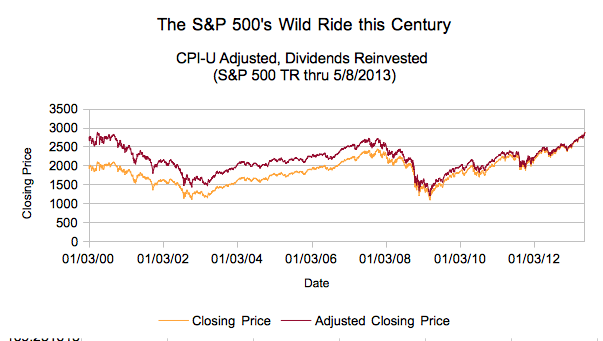 Today was the all time high closing price for the dividend reinvested, inflation adjusted S&P 500. 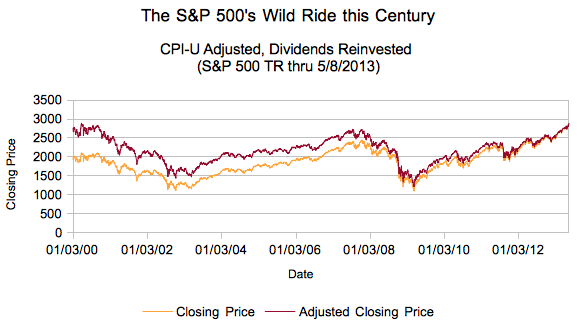 The S&P 500, factoring in CPI-U seasonally adjusted inflation and reinvesting dividends just closed at a new peak. The previous peak was on March 24, 2000. Too bad you didn’t buy the Dow, eh? Take the CPI-U, Seasonally Adjusted from the St. Louis Fed’s awesome FRED site. Find S&P 500 Total Return Data. I grabbed this from Daily Finance. Interpolate to find DAILY inflation numbers. If you want a shortcut, I built a daily inflation calculator. For the days since the last inflation report, extrapolate (again, the inflation calculator does this automatically, and updates itself once a month) to get the daily inflation numbers. I’m using the last 3 months to figure out the slope for this month – this might later get revised away (yes, I recognize that – consider it accurate as of today!). For TODAY, 5/28/2013 I have a S&P 500 closing price of 2886.35. On 3/24/2000, the S&P TR closed at 2107.277. Respectively, I (using inter/extrapolate in OpenOffice) have daily inflation indices of 234.0343141982 and 170.9258064516. Put them together and you get 2886.35 for today, and 2885.3169556953 for 3/24/2000. There you go – that’s a pretty horrible return for 13 years, but at least it’s positive! Too much work? Well, if you’re okay with a lower resolution, we do have a great tool for that… the dividend reinvestment calculator for the S&P 500 is found on this very site! Don’t you love us? Yeah, I know. How far do you want me to take this analysis? The irony, of course, is that income taxes are inflation adjusted, but capital gains are not. So if you held on for 13 years and sold today, you’d owe taxes on a 36.97% gain, not the actual 0% gain in purchasing power you just recognized. Plus you’d have to pay a transaction fee. For shame! Anyway, there you have it – this is a day that will live in infamy. Meet the new inflation adjusted dividend reinvested closing price boss, same as the old inflation adjusted dividend reinvested closing price boss! Sweet work. I did a similar thing a while back just for grins and giggles to see what an inflation-adjusted SP500 Index looked like compared to the “real” index. (Here’s the chart: http://38atoms.com/wp-content/uploads/2012/10/SP500-2012-dollars-adjusted.jpg) You went into way more detail than I did, though. OK, I’ll be honest – you worked on it a lot harder than I did. I appreciate you spelling out exactly how you did it though. Thx. Thank you, sir. It might be hard to dig up my work now, but I make it a point to spell out exactly how I did something on all of my articles. Of course, I can count on one hand the number of times someone told me they reproduced my data set, haha.